Chelsea star Eden Hazard looked on the verge of tears after his side’s 6-0 thrashing at the hands of Manchester City at the weekend. The Belgium international has been linked strongly with a move away from Stamford Bridge in recent times and on this evidence he cannot be happy with life at his current club. 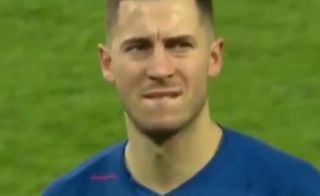 Hazard looked visibly gutted to be on the end of such a humiliating result, with Chelsea suffering their worst defeat of the Premier League era.